BHUBANESWAR: The provision of setting up a railway maintenance workshop at Narla in Kalahandi in the Railway Budget evoked mixed reactions here. While some sections of people said a wagon factory would have generated more employment, others expressed satisfaction at the railway ministry’s decision. The Kalahandi Swabhiman Jagaran Sangha, an outfit which has been pressing for a wagon factory, felt disappointed at the decision to set up a maintenance workshop instead. 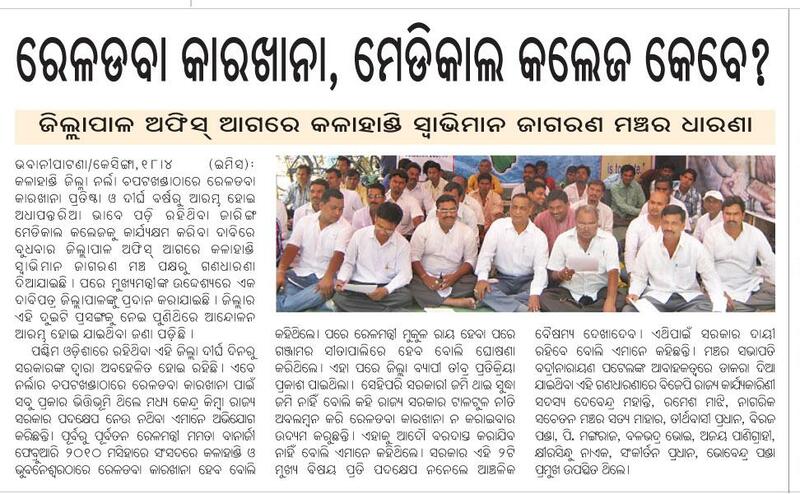 President of the outfit Badri Narayan Patnaik said they would again press for a wagon factory. “We will again move the railway ministry through Kalahandi MP Bhakta Das to demand a wagon factory,” he said. In 2010, then Union railway minister Mamata Banerjee proposed a wagon factory to be set up in Odisha. 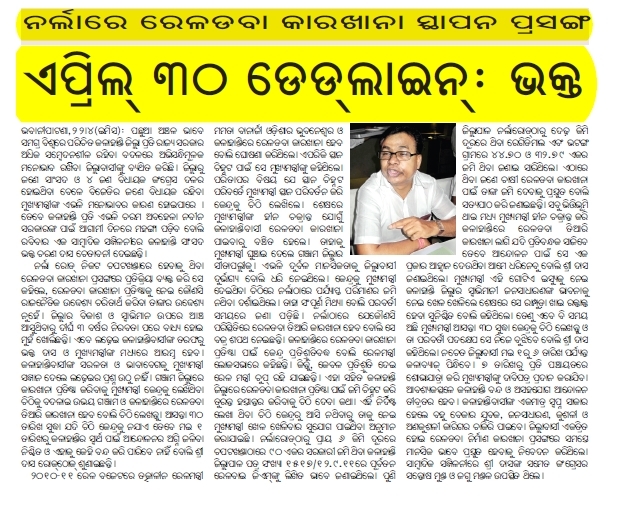 Chief minister Naveen Patnaik had recommended Ganjam for the factory. The railway ministry subsequently decided to set up the wagon factory at Ganjam. “Kalahandi, which is considerably more backward than Ganjam, deserves a wagon factory,” said Patnaik. Earlier, the Narla Rail Wagon Nirman Sangram Samiti in Kalahandi had also demanded a wagon factory to be set up at Narla. “We are happy that Kalahandi found a mention in the budget but we would have been doubly happy had the wagon factory been set up here,” said Congress state coordinator of schedule caste cell Debi Prasad Sindoor. He, however, attacked Naveen for delaying the land identification process, which is why, according to him, the wagon factory went to Ganjam. Narla has enough land for a wagon factory, he said. Kalahandi MP Bhakta Das had also accused Naveen of showing apathy towards identifying the land at Narla. Odisha government today offered to provide land for establishment of a railway wagon factory in tribal dominated Kalahandi district, official sources said. Indian Railway, which had already sanctioned Rs 1 crore for establishment of the first wagon factory at Sitalapalli in Ganjam district during 2012-13 fiscal, had also indicated that it would not hesitate to construct another such project if the state government provides land. “Responding to the Indian Railways, the state government had already identified land to set up the second wagon factory in Kalahandi district,” the official said. 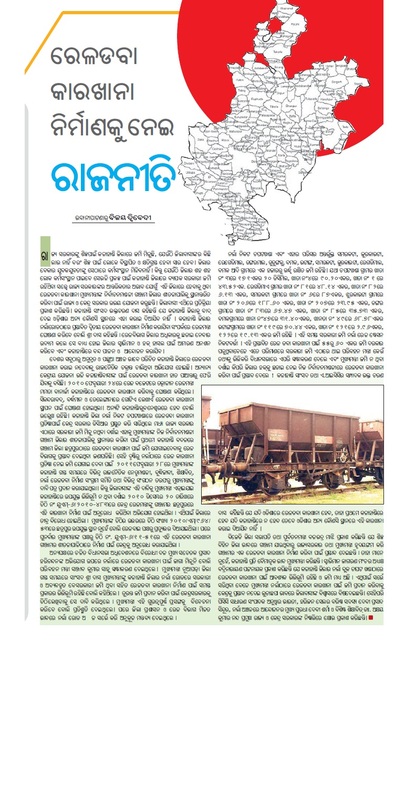 A railway wagon factory in the undeveloped and tribal dominated district like Kalahandi, would certainly help boost the economic condition of the local people. The state government would provide all assistance for establishment of the wagon factory in Kalahandi, chief minister Naveen Patnaik said. BHUBANESWAR: The State Government has demanded 12 new trains in the 2012-13 Railway Budget. The new trains are, Bhubaneswar-Mumbai/Pune, Puri-Jeypore/Jodhpur, Bhubaneswar-Bangalore, Puri/Bhubaneswar-Surat (all Duronto express), Rourkela-New Delhi, Keonjhar-Howrah, Barbil-Visakhapatnam via Keonjhar andBhubaneswar, Titlagarh-Bhubaneswar via Rayagada, Bhubaneswar-Shiridi daily express, passenger train service between Barbil-Puri and passenger service between Bhawanipatna-Bhubaneswar via Sambalpur. In a letter to Railway Minister Dinesh Trivedi, Chief Minister Naveen Patnaik has also demanded increase of frequency of several trains following persistent demand from the travelling public. The trains are, Bhubaneswar-Kurla-Lokamanya Tilak express, Puri-Ahmedabad express via Sambapur, Bhubaneswar-New Delhi Rajdhani express, Puri-Patna Baidyanath express and Puri-Guwahati express. CuttackandBhubaneswarare being developed as twin cities and as per the comprehensive development plan prepared by Indian Institute of Technology (IIT), Kharagpur, the combined population will be 2.7 million by 2021. Stating that this will necessitate a mass rapid transit system (MRTS), Naveen said that this was the appropriate time to commence detailed planning for rail based city transport system in greaterBhubaneswarregion. Stating that the operationalisation of East Coast Railway (ECoR) has brought railway management closer to the people and problems of Odisha, the Chief Minister demanded extension of its jurisdiction to include Banspani-Padapahar section, Bhadrak-Laxmannath section inKhurda Roaddivision and Jharsuguda-Barasuan-Kiriburu, Rourkela-Nuagaon and Jharsuguda-Himagiri sections in Sambalpur division. Besides, appropriate functional reorganisation of ECoR will necessitate the creation of a new railway division atJajpur-Keonjhar Road, he said. The Chief Minister has demanded that the doubling work of Rayagada-Koraput and Kottavalsa-Kirandul broad gauge rail link should be sanctioned. He also said that the doubling work of Khurda Road-Puri link (phase-II), Raj Athgarh-Barang andBarang-Khurda Roadthird line should be expedited. These projects should be commissioned in 2012-13 with provision of enhanced budget, he said. He demanded the electrification of Talcher-Sambalpur-Jharsuguda, Sambalpur-Titlagarh and Koraput-Rayagada railway lines should be sanctioned. He requested that execution of world class station atBhubaneswarand Puri should be expedited. Railway stations at important district centres and major tourist destinations need special attention to provide multi-functional complexes and upgraded passenger amenities, he said. The Chief Minister also sought introduction of DMU services in Sambalpur-Jharsuguda-Rourkela and Berhampur-Balasore corridors. He said that a new train service from Puri to Pune and Mumbai via Sambalpur and Titlagarh has become essential. Advocating for a self-sustainable and workable PPP initiatives in the coal and iron ore sectors, the Chief Minister has requested formulation of a suitable policy for attracting private investment in the development of dedicated rail corridors. Chief Minister Naveen Patnaik on Wednesday urged Prime Minister Manmohan Singh for provision of Rs 2,345-crore package in the 2012-13 Railway Budget for the development of railways in the State. Patnaik, in a letter to the Prime Minister, has given a long list of proposals on development of railways in the State which had been neglected by successive Union Governments. He urged the Prime Minister to ask the Railways Minster to take necessary steps for allocating required funds for new as well as ongoing projects. Besides, he urged the Prime Minister to advise Ministry of Railways for strengthening of railway infrastructure in Odisha. In his proposal, Patnaik has indicated some new lines, doubling of tracks, electrification, gauge conversion and passenger amenities. Patnaik in his proposal has urged the Prime Minister to provide railway connectivity to all the ports within definite timeframe, besides declaring at least three railway projects with the status of National Projects and to convert theBhubaneswarand Puri railway station to world class stations. Stating that Odisha continues to be one of the most preferred destinations for investment, especially in metal, mining and power sectors, he said the State Government was leveraging this opportunity to plan orderly, systematic and comprehensive economic growth by focusing upon infrastructure development and creating dedicated industrial corridors. The nature of industrial activities in the State requires a robust and well-planned railway infrastructure for its sustainability, Patnaik pointed out. He said the Central Government had initiated many ambitious projects like dedicated freight corridor aligned with mega industrial hubs, national road express ways and high- speed train projects. But those projects appear to have completely bypassed Odisha although some of the country’s largest investments in the steel, aluminium and power sectors are coming up here. Referring to the railway lines, he said the railway route length and rail density in Odisha was well below national average as also substantially lower than that in neighboring States. In his proposal, Patnaik requested the Ministry of Railways to put in place a time-bund infrastructure upgradation arrangement for the ports coming up on the Odisha coast. “A synchronised development plan between that of the ports and related rail connectivity is necessary for maximizing economic gains, he said. In this context, Patnaik said the eastern dedicated freight corridor fromLudhianato Dankuni should be extended to Brahmapur so as to ensure seamless movement of freight between the ports and the northern and central hinterlands of the country. He proposed for construction of Bharachaam Road-Talcher rail link via Malkangiri, Jeypur, Lanjigarh, Sambalpur-Brahmapur new rail link via Phulbani and Rayagada-Gopalpur rail link via Bhismagiri. Pointing out that survey for these lines have been sanctioned, he urged the Prime Minister to advise the Ministry of Railways to execute the projects on priority basis, treating these projects as “National Projects”. He also urged Singh to expedite execution of a World Class Station atBhubaneswarand holy pilgrimage town ofPuri. Similarly, the railway stations at important district centres and major tourist destinations need special attention to provide “multi-functional complexes” and upgraded passenger amenities. Besides, Bhubaneswar-Cuttack region which is planned as a mega urban complex also needs to have a rail-based urban transport system, he said.